Two young Sikh men have taken a universal message of love, respect, and tolerance to the airways. Bhupinder Singh and Harkeerat Singh are the creators of Seeking Sikhism, a spirituality-based television show that explores the teachings of the Sikh religion. 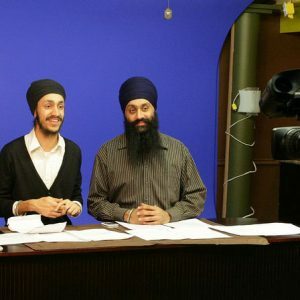 Their goal is to provide a forum for viewers to better understand the true meaning behind Sikh teachings. “We decided to start the show in order to spread the message of Sikhism to as man people as possible, and to educate viewers about the teachings of Sri Guru Granth Sahib Ji, the Holy Scriptures of the Sikh religion,” says Bhupinder Singh. The duo sees the show, which is in English, as bridging a language gap of sorts. Through analogies and examples, as well as the use of visuals on-screen, the co-hosts hope to keep their audience engaged and entertained. “We use modern-day analogies and stories to make the point, so that young people can relate to what we are saying”, adds Harkeerat Singh. “We want to attract the youth of today so they can reconnect with their spirituality”. Harkeerat Singh hopes that by identifying himself proudly as a Sikh, and being out and about on the streets of Vancouver daily, he can demonstrate to people that one can strive to follow his or her religion, learn more about spirituality, and spread the meaning of love all while “talkin’ the talk and walkin’ the walk”. On top of their priority list, say both, is to raise enough funds to continue broadcasting Seeking Sikhism. First of all, Waheguru Ji Ka Khalsa Waheguru Ji Ki Fateh! In the end I guess what I am really just trying to say is that they are AMAZING! They add some humor, intensity, personal experience and pros and cons to the conversation. In other words they set forth the facts and leave the rest up to you. After you watch their videos it is your choice to what path you choose. May God bless them, may God bless us all!